Sioux City Deacon Formation: Pope Francis addresses Pontifical Council for New Evangelization: "Strip ourselves of all that is useless or harmful..."
Pope Francis addresses Pontifical Council for New Evangelization: "Strip ourselves of all that is useless or harmful..."
On October 14, Pope Francis held an audience with the assembled Pontifical Council for Promoting the New Evangelization, and gave an excellent short address. He's pushing hard on the need to evangelize with a more pure and less compromised commitment to the Gospel, whole and true; and he's right to do so! Zenit has the whole address in English translation. Here are a few thoughts. way, through love, concord, joy, suffering, because this elicits questions, as at the beginning of the journey of the Church: Why do they live like this? What drives them? These are questions that go to the heart of evangelization, which is the witness of faith and charity. What we need especially in these times are credible witnesses who with their life and also with the word render the Gospel visible, reawaken attraction for Jesus Christ, for God’s beauty. So I think what he means by "useless and harmful things" are the things that intrude in the life of the Church, separating faith from everyday life, things that are in some sense opposed to these two little lists; things that obscure rather than simplify the life of faith, or that render the mystery of Christ banal, or that marginalize or contradict the Scriptures and the sacraments, and so on. That list is obviously very long, and indeed, very well known in the life of the Church, since every age has its particular challenges to the purity of the Good News the Church is preaching. And it is always a struggle, in the human sense, to fight against those intrusions for the pure teaching of Christ. The New Evangelization is a renewed movement towards him who has lost the faith and the profound meaning of life. This dynamism is part of the great mission of Christ to bring life to the world, the Father’s love to humanity. Again, this is a clear recognition of the need of people for Christ's great mercy, and therefore the urgency Christians ought to have to offer Christ's life, the Father's love, to the darkened world. This mission is Christ's, and therefore ours in the Church. It's ours both because Every baptized person is a “cristoforo,” a bearer of Christ, and because No one is excluded from the hope of life, from the love of God. The Church is sent to reawaken this hope everywhere. In the Church all this, however, is not left to chance or improvisation. It calls for a common commitment to a pastoral plan that recalls the essential and that is “well centered on the essential, namely on Jesus Christ." It is no use to be scattered in so many secondary or superfluous things, but to be concentrated on the fundamental reality, which is the encounter with Christ, with his mercy, with his love, and to love brothers as He loved us. A project animated by the creativity and imagination of the Holy Spirit, who drives us also to follow new ways, with courage and without becoming fossilized! This "pastoral plan centered on Christ," then, is not something new. It's what the Church has alwaysreverent worship in the liturgy, touching people deeply with the profound mystery of Christ at the intimate moments of their lives, as well as all through the year; sound Gospel preaching, including the denunciation of the evils of the day, and the call to conversion; moral clarity and leadership; taking care of the "orphans and widows," those who are least able to care for themselves - especially today in the face of the culture of death, the unborn and the elderly and very sick; radical hospitality, and the "preferential option for the poor;" and so forth. It is the three-fold work of the Church for liturgy, proclamation, and ministry, which we see in the Book of Acts and always and everywhere in the Church since, but, as he began this address, unencumbered by the cultural dross of particular times and places. In this context I would like to stress the importance of catechesis, as an instance of evangelization. Pope Paul VI already did so in the encyclical Evangelii nuntiandi (cf. n. 44). From there the great catechetical movement has carried forward a renewal to surmount the break between the Gospel and the culture and illiteracy of our days in the matter of faith. I have recalled several times a fact that has struck me in my ministry: to meet children who cannot even do the Sign of the Cross! Precious is the service carried out by the catechists for the New Evangelization, and it is important that parents be the first catechists, the first educators of the faith in their own family with their witness and with the word. We can't offer people a pure and vibrant faith unless we ourselves are well catechized. It's too easy, especially in this world described as "post-Christian," unwittingly to mix faith with not-faith, with moral platitudes (which may perhaps be true in themselves, but which don't lead to Christ), or with political agenda or social activism (which, again, may be either true or false, good or harmful, but which cannot lead to Christ). I'm really impressed with the clarity and consistency of Pope Francis's direction, in this address. He sounds "papal," even as he gives his words a personal urgency, an authenticity from his own pastoral zeal and experience. What he seems to be urging us to consider is that we are not nearly radically enough "for the Gospel." We make so many little compromises with the world. Many are necessary, most are not bad or evil in any sense. But all of them dull the brightness of the pure Gospel. They cause us, for example, to think twice before speaking out against some moral evil or injustice, or to make subtle shifts in our priorities among transient goods that obscure in some degree our commitment to spiritual and heavenly goods. These little compromises "domesticate" Christ. They make Him fit into our existing lives, rather than making us change our lives to fit into His. That's where we need a visibly greater degree of "purity," like St. John the Baptist - of prophetic stance outside the world and its systems of compromises to preserve whatever goods are valued at the time, and radical commitment to the only lasting good, salvation in Christ. 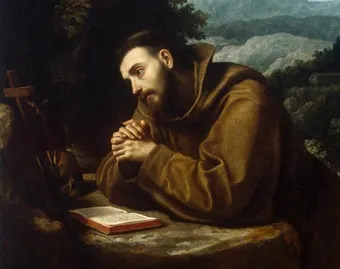 St. Francis in his day retrieved for the Church the apostolicity of poverty, from those who were using poverty as a weapon against the Church ("bishops are wrong because rich," "sacramental records are a tool of the government to tax the poor," etc.). What we need today is to retrieve the apostolicity of charity, from those who are using charity as a weapon against the Church (i.e., "caring for women means supporting abortion," "caring for the poor means supporting such-or-other government program or ideology," "caring for children means unraveling real marriage," etc.). This is why we need a more radically "evangelical" Church, one which can oppose those dark powers, not just with some alternative-but-still-essentially-worldly program, but with a recognizably spiritual program: the Gospel of our Lord Jesus Christ.